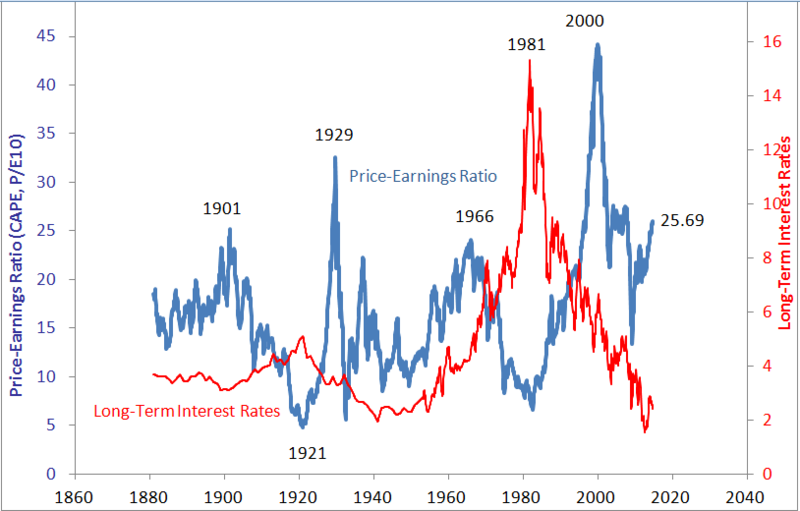 Robert Shiller, who has a pretty accurate gauge of stock market valuation (The CAPE model), came out recently reiterating how the market appears overvalued. In this New York Times article, he details how the market is at its highest level, matching levels not seen since 1929, 2000 and 2007. The current CAPE is around 25 – it was at this level in 1996 and 2005, so indeed we could have a few more years before valuation reverts to the norm. But this is like a game of musical chairs, whereas when the music stops and people rush to get out, you wont want to be left standing alone. And given the Fed is still making asset purchases as part of the economic recover from the last big market correction in 2008, if the fall happens anytime soon, it could be a bad one. While poking around the internet trying to make sense of what is going on in Ukraine and why Russia is so interested in it, I now have something that at least makes sense. An interesting place to start is this South Stream pipeline that Russia is building in partnership with several western European countries (and apparently no US companies). The terminus where the pipeline leaves Russia is at Beregovaya, but upstream from that the only access is via eastern Ukraine. If an unfriendly Ukraine shut down that portion of the pipeline, there is no backup route. So that seems like a decent motive for Russia to maintain a presence in eastern Ukraine. Of late the pro-Russian separatists have reportedly been losing ground, though the pipeline area still seems to be in the area of pro-Russian control. The pipeline isnt set to be operational til 2015, so maybe this battle for control will be going on for awhile. A friend asked me the other day my opinion on the Amazon vs Hachette controversy, and I responded that I hadn’t given it much thought. However, that spurred me to do a little thinking on the topic, and it let me to a conclusion that I think both sides are wrong. Apparently the argument between Amazon and Hachette is that Amazon wants to fix the price of e-books at $9.99, and Hachette is resisting. I think Amazon is wrong in getting involved in any pricing of vendor products – but its interesting to think about their motivation. Hachette is clearly worried about e-books being significantly cheaper than print books – because one has to wonder – is there a purpose for a middleman publisher in the e-book space? What value does Hachette bring to the author for an e-book? It seems to me Hachette needs to keep print books a significant market share in order to attract authors to use print publishers. Therefor, they have incentive to sacrifice e-book sales by keeping the price higher to push people to print books. So is Amazon seeing thru this by saying – OK fine – you can’t sell any books through our channel – making it harder to sell print books and thus making authors less interested in partnering with a publisher. Even if Amazon loses this and relents, I think the publishers will lose in the long run. Lets say the de-facto standard for a Hachette e-book is $16.99, Amazon takes their 30% cut, and Hachette takes their 30%(?) cut, that leaves the author with $7 a sale. Wouldn’t an established author just not renew his contract with Hachette, and sell the e-book for $16.99, and pocket $11 a sale. And then for people that want printed copies of the book the author can use Print on Demand. (Amazon has already set up a company to do this – https://www.createspace.com/). So to sum it up – I think this argument is flawed on two sides – Amazon thinking that Hachette raising the price of e-books will slow the growth of e-books, and Hachette thinking demanding a premium for e-books will keep established authors in their camp. Every once in a while luck turns out to be better than wisdom in investing. My most recent example of dumb luck in investing was Canadian Pacific Railway, an stock position It took back in June 2011. My decision to buy the stock primarily based on the thesis that oil prices would be ramping up as the Chinese and other emerging markets started demanding more oil. The assumption was that as energy prices go up, more goods would be shipped by train than by truck. My thesis turned out to be wrong, there was no oil shock, and the discovery of additional oil fields and fracking let to an increase in domestic oil production. As luck would have it, the domestic oil production increase was in North Dakota – in Canadian Pacific’s backyard, leading to a large increase in oil by rail for Canadian Pacific. The other piece of luck was an activist investor group tried to grab control of the company, leading to a big proxy fight and led to a runup in the stock (Interestingly, that also led to the only time I have ever been called at home asking for my vote in a proxy vote for a stock – I don’t even know how they got my phone number). To be fair to myself, the other reason I bought Canadian Pacific was the yield was over 2% at the time, and the dividend appeared safe, so it was a conservative bet. Last month I sold out of my position because I didn’t really know why I still owned it, except for the reason was it keeps going up. The valuation wasn’t great, and the dividend yield is now down under 1%. So I decided it was time to get out. I could be wrong, but I can’t depend only on luck when investing in the stock market. 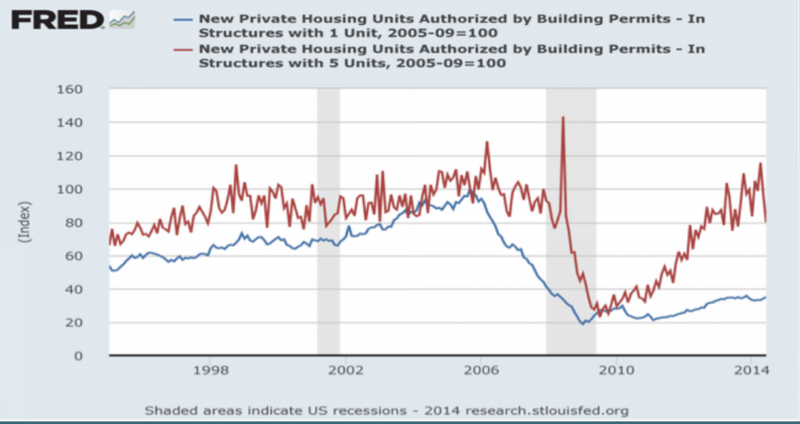 A Structural Change In The Housing Market? Back at the dawn of the internet age, I recall speculating with co-workers on whether or not the internet would spur population spread to the suburbs or rural areas, since so much more could be done without a physical presence(i.e working remotely, shopping online). But looking at this chart, it would seem the population is aggregating in urban (or at least concentrated) areas. Another thought is perhaps this could be related to the aging baby boomers downsizing, thus flooding the market with single family homes. I don’t know if four years can be considered a firm trend, but it does appear the demand for housing is shifting to more people owning condos or renting apartments. If you believe this is a trend that will continue, how should you invest to take advantage of this trend? Maybe concentrate on REIT‘s that invest in urban properties, or focus on businesses that service the urban consumer. At any rate, it is a trend worth keeping an eye on and could impact the economy in unique ways.